Every one of your teeth is important for your health and comfort – not to mention your smile. Many folks have lost more than one, and a full 26% have lost ALL their permanent teeth by the time they reach 74.2 So, if you’ve lost one or more teeth to injury, gum disease or some other problem, you’re definitely not alone. That may sound like a reasonable choice, but it can lead to some very unpleasant consequences, including problems with your speech and difficulty eating some of the foods you love. Clearly, doing without is a bad idea. But what should you do instead? Fortunately, today there’s a far better option. Dental Implants, these replacement teeth look, feel and act like your own natural teeth. In fact you could say they’re actually better because they never decay and, unlike bridges, partials and dentures they may last a lifetime. 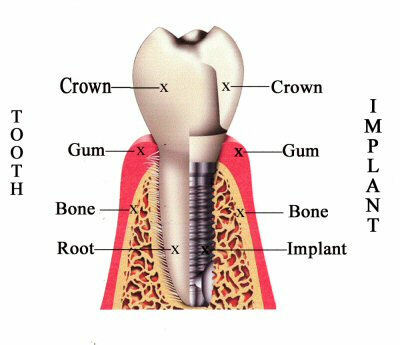 Each implant starts with a high-strength, FDA-approved titanium “root” (what we dentists refer to as an abutment) that your body accepts as though it were a natural root. In fact, your body welcomes it so thoroughly it almost magically re-grows new bone around it. It’s as though we slipped a brand new root under your gum and placed a brand new tooth on it. You brush and floss the new tooth just like any other – and you can go back to eating all the foods you enjoy. Implants can give denture wearers their confidence back as well by letting me create “anchors” that provide a strong and reliable foundation for dentures.4 So you can eat anything you like (including things like apples, carrots and corn on the cob), throw out that tube of messy adhesive and forget tell-tale “clicking” when you eat. Sound good? Then you won’t be surprised to learn that the vast majority of dental implants placed more than 20 years ago are still performing well and the folks who have them are still sure they made the right choice. If you’ve been doing without one or more teeth – or if you’re dissatisfied with a bridge, partial or dentures, just ask. My staff and I will be delighted to give you all the information you need to see how close dental implants are to getting your own teeth back. Larrondo Dentistry is located at 160 S. Santa Fe Street, Hemet, CA.